Lars Kullberg VP, Customer & Business Development, talks to InterComms about the Ascade’s Carrier CockpitTM product and its role in bringing profitability to telecom carriers international voice business worldwide. Q: What is the history of Ascade? 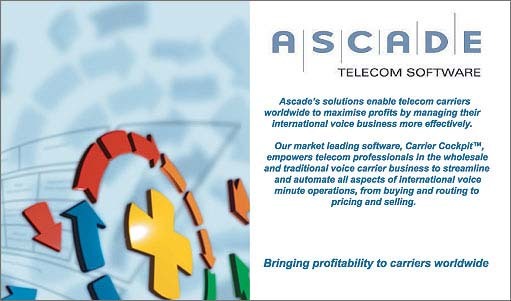 A: Ascade was founded in 1997 as a telecommunication consultancy company. Subsequently, we identified an interesting niche through working with a major Nordic operator - building business management solutions in support of international voice carriers. Ascade then began to develop the Carrier CockpitTM. This turned us from being a consultancy company to being a product company some four yeas ago. The whole idea behind Carrier Cockpit - is to have an integrated solution where carriers can manage and control their entire international voice carrier business from one point, organizationally as well as geographically. It streamlines, optimizes and automates all aspects of international voice operations, from buying and routing to pricing and selling. Carrier Cockpit™ also provides management with real-time revenue assurance and business steering capabilities supporting various carrier business models and parameters. We began to sell Carrier Cockpit - during 2000, with the first customer being Swisscom in Switzerland. Swisscom have used Carrier CockpitTM for over two and half years. By June last year we had acquired several new customers and this year we have made our breakthrough also into the Asia-Pacific market. Ascade is the market leader with the Carrier CockpitTM solution that increases the ability of carriers to become more profitable by effectively steering their voice carrier business. We are proud to be able to deliver a solution that increases carriers’ profitability by optimizing their everyday business process. Q: How is Ascade developing its customer base regionally? A: It was only during this year that the market for this kind of product matured and many of our potential customers are now actively looking for a solution like Carrier CockpitTM to manage and control their international voice carrier business. We have effectively ‘kicked off’ the market for this type of product. We focused on Europe last year and Carrier CockpitTM is now actively in production in Central and Eastern Europe as well as in the Nordic region. During 2003 we have also targeted Asia-Pacific where we now have two new customers; Mobile One in Singapore and Reach in Australia/Hong Kong. Q: Are there regional differences in the requirements of carriers? A: The differences are not based on geographical locations, as demands are roughly the same worldwide. Differences are instead based on whether the carriers are operating in a regulated or de-regulated market and also more affected by which customer segments the different carriers are targeting. Our focus is to provide a product based on a solid foundation and work with adaptations and customization for the different carriers. Q: The market growth for international calls has been put at 10-15 percent annually. Is this a fair assessment? A: Yes, but when we come to market growth figures it is always difficult as there are many figures from many sources. I believe that the market growth from a wholesale perspective is around 10 percent on traffic minutes on a worldwide basis. In monetary terms we can conclude that although international minute growth is 10 percent per year, the revenues are stagnating or even declining. This is what carriers are struggling with at the moment in order to keep or grow their international voice revenues on a stagnating market. The discussion is really about where the voice traffic originates. Do the international voice calls originate from mobile or fixed network subscribers? The usage of mobile phones is expanding across the world and has become a substitute for fixed phones in Eastern Europe and Asia, for example. Q: What does Carrier CockpitTM do in layman’s terms? A: In short, Ascade’s Carrier CockpitTM solution enables carriers worldwide to cut costs and lift productivity by optimizing and automating in-house and external business processes. Carrier CockpitTM offers support to accelerate and optimize business-critical decisions in the four key processes of buying, routing, pricing and selling of international voice minutes. Carrier CockpitTM automates and simplifies these processes, slashing superfluous costs. The system interlinks geographically diverse organizational units and frees up users to focus on the right things TM it simplifies everyday routines, helping users filter the growing information volumes that wash over daily. We acknowledge three important steps in the voice carrier business. The first step is to streamline the internal commercial processes where a lot of carriers currently have implemented such a process or are planning to do so. The next step is to streamline and automate processes between the commercial and technical departments, to take these commercial routing decisions into the switch and get feedback from the switch. Thirdly, there is a lot of information that is exchanged between carriers today which needs to be exchanged in an automated way as well. As I mentioned, we have defined four key processes that voice carriers need to manage. First, many carriers handle rates and offers from vendors manually, a time-consuming task that generates unnecessary costs and slows down the process. The rates are often offered in a multitude of different formats, which causes problems and the absence of standard destination definitions is a source of confusion and heavy costs for all parties involved. Typically a carrier might collect 100 rate sheets on a regular basis with 600-800 rates from A-Z. Carrier CockpitTM facilitates the rate handling process including automatic import of rates, area codes and quality indicators offered by vendors; the system recognizes and remembers the individual vendor's destination definitions. Users can create, analyze and map the destinations offered against their own destination definitions to rank suppliers and identify breakout opportunities. A majority of the voice traffic volumes are handled through complex agreements, and to manage these in an optimal way is also a challenge for many carriers. Carrier CockpitTM enables the creation, analysis and simulation of all wholesale and bilateral agreements on the market with multiple scenarios and outcomes including multilevel price models, reciprocal deals and volume commitments. Secondly, the number of destinations on offer on the global market is exploding, while more carriers are offering several products or service levels and time-of-day routing. The days when carriers routed traffic according to Least Cost Routing principles are gone; now carriers must apply various strategies for optimising the routing tables based on differently positioned products. Carrier CockpitTM offers breakout analysis support, when you can select the most accurate destinations to implement on your switches. Carrier CockpitTM enables an unlimited number of routing tables, products and service levels to be maintained. The dynamic routing algorithm captures parameters such as routing strategy, reciprocal deals, volume agreements, rates, quality and capacity. It offers constant access to the latest quality and capacity data on your and other carriers’ networks. Once you have taken your commercial routing decision you want to implement your decision into your switch, i.e. route your traffic streams. Carrier CockpitTM uses the network topology to optimize and automate the entire process from commercial routing orders through technical routing transformation to automatic implementation of MML-scripts in proprietary switches. Routing cases are updated in the desired number of routing tables, enabling routing changes in minutes rather than weeks with guaranteed quality. Once you have gone through these stages you are into the third phase - pricing. A key success factor for carriers is to position their offering in the most favourable way on the market by creating differentiated products and offers. To be successful, pricing and product managers must have extensive information at hand when creating competitive products to win traffic and sustain margins at the same time. The Carrier CockpitTM renders tariff-setting quick and easy with a multitude of cost definitions automatically calculated by the system based on the actual and future routing structure as well as all different price models available on the market. Users can steer and track the set pricing against the actual outcome at any given time and the system offers extensive support for managing margins in an optimal way. The fourth process is selling. With increased competition and price pressure, it is crucial to act quickly on opportunities and keep tight control of market fluctuations. Traffic or margin drops as well as loss-making destinations must be detected and acted upon immediately. Maintaining good relationships with customers and being able to meet their needs requires access to flexible tools and complete information at hand during negotiations of all kinds. Carrier CockpitTM provides invaluable support in this process, keeping users informed when a customer’s traffic revenues drops, where volume agreements are over-looked, when customers fail to route traffic despite a price match and all other feasible scenarios. Functionality includes both sophisticated possibilities for creating standard or customized price lists with customer specific layout and support for on-the-fly rate negotiations over the phone, out travelling or at meetings. Carrier CockpitTM also assists the user to receive alerts when margins are dropping, prices must be increased on specific destinations, volume agreements are converging on a threshold, or a customer’s traffic ceases. Q: Are there any big changes on the horizon? A: I have recently conducted a market survey based on feedback from a majority of leading carriers about their views on the market trends and future developments. Most of the carriers foresee a future progress with a continued price pressure, creating an even more complex voice business to manage, as well as continued drop out of carriers unable to manage their business effectively. All carriers want to cut costs in the areas where they can: cost of termination, network and administrative costs. In addition, they want to increase revenues where they can, among other things by developing new services, as mentioned earlier, and by focusing on revenue intense regions and destinations. Some carriers believe that IP technology will, sooner rather than later, affect how the minute business is handled and we may in the future move into a package based voice business. A majority of the carriers still see this as development for the future. The debate now is at when and how fast this will happen. Q: What are the discriminators for success for products such as Carrier Cockpit? A: On the market today people talk about BSS (Business Support System) and OSS (Operation Support System). Carrier Cockpit is something more than that - it is a BOS (Business Operation System). We find it crucial that as a carrier you have one integrated solution where you manage the entire international voice carrier business in one solution. This is instead of having a scattered picture resulting from using different systems to manage parts of the processes and parts of the functionality. We believe that carriers need to take a holistic approach to the business - to have one integrated solution to cover all of the key processes. Q: How does Ascade incorporate input from customers? A: Ascade has always had the philosophy to have product development in co-operation with our customer. When we develop new functionalities we try to include customer demands in order to provide new features and functionalities that go hand-in-hand with market needs. Now that we have a good number of customers we work through our User Group Forum to get input from our customers while planning for the next product release. We let the customers define certain key areas they believe are important in product development. Q: Can you give me an idea of the savings to the carrier from this software? A: We estimate savings in a carrier’s total cost base at about 5-8 percent. There are also additional margins to gain on the revenue side at about 3-5 percent – all in all a total of about 10-15 percent. A: While focusing on Europe during last year and having added Asia-Pacific to our markets in 2003, we are now expanding into the Americas.